The industry’s first medium telephoto macro lens designed for APS-C size digital SLR cameras that features a fast maximum aperture of F/2.0—one stop faster than the F/2.8 maximum aperture found on conventional macro lenses in the same class. For Canon. 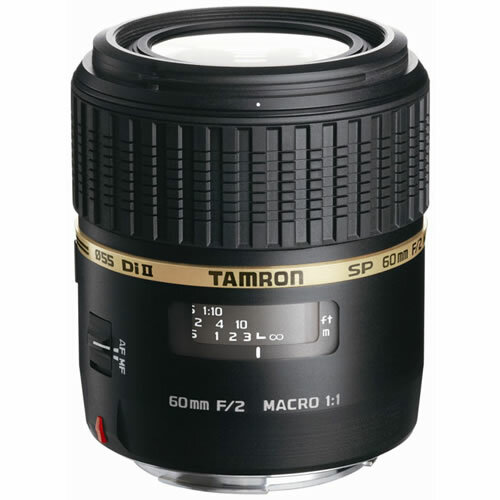 The Tamron SP AF60mm F/2.0 Di II LD 1:1 Macro (model G005) is the industry’s first medium telephoto macro lens designed for APS-C size digital SLR cameras that features a fast maximum aperture of F/2.0—one stop faster than the F/2.8 maximum aperture found on conventional macro lenses in the same class. The SP AF60mm F/2.0 covers an equivalent angle of view of 93mm when converted to the 35mm format. With is fast F/2.0 maximum aperture, the new macro delivers dramatically attractive blurred background effects. And the addition of Internal Focusing (IF) and Full Time Manual Focus Control Mechanism to its list of highlight features makes this lightweight and compact 1:1 macro lens incredibly easy to use. For Canon, Nikon and Sony APS-C size DSLRs.